Article on EoZ and other pro-Israel activists in Makor Rishon. Even a photo! Four months after the conference in Jerusalem for pro-Israel activists, the article about it was finally published in Makor Rishon. It shows a little more of me than I'm thrilled with, but there you go. In order to meet with Elder, a veteran pro-Israel blogger who came to the conference, I first have to promise that his identity will not be revealed in the article. Even his badge shows only his nickname from the virtual world. "As a high-tech worker, I do not want my name to come up on Google as a pro-Israel activist, and if I look for work in the future, it can hurt me," he explains. All that can be revealed is he an American Jew in his fifties, a resident of the East Coast, who comes from an haredi background [not really] and defines himself as modern Orthodox [not quite.] 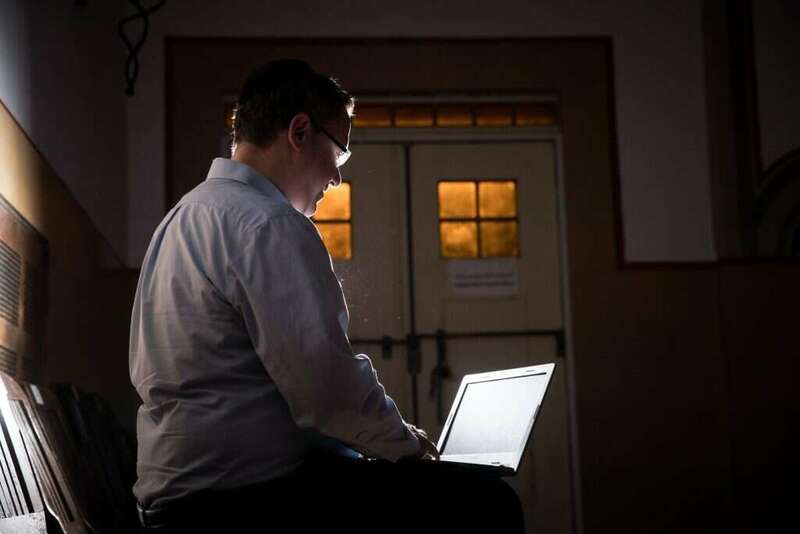 Since 2004 he has been running the "Elder of Ziyon" blog, which draws nearly half a million views every month and boasts tens of thousands of social networking followers. At his workplace they know nothing of his side-business. Every day, Elder publishes about four articles on his blog, including original content in a variety of fields. "I was active in Yahoo forums, when they were still very popular, and I argued there with others on issues related to Israel, until I realized that it was a waste of time." On the Elder of Ziyon, he says: "This is a blog that provides analyses of current Middle East issues, or news you have not seen elsewhere, the agenda is to attack anti-Israel incitement and talk about anti-Semitism in general. There are many stories in Arabic that expose terrible anti-Semitism and distortion of facts. " One of his first articles dealt with the concept of "Palestinian." "I went to the New York Times archives and searched for articles that were published before 1948 [with the word "Palestinian."] I saw all the references to the Jews living in the area, and I posted a lot of screen shots with pictures of Jewish pioneers, and I wrote, 'That's how Palestinians looked before the establishment of the State of Israel '". Eldar speaks at a dizzying pace. His mind works very quickly, which is also reflected in the unique content he brings to the blog. In 2012, when an BBC reporter reported on a Palestinian child killed by an Israeli missile during the "Pillar of Defense" operation, Elder looked at the pictures and immediately understood that this was a deception. "I said to myself: It looks like a Qassam," he says. His acquaintance, an expert on the subject, looked at the picture he had given her and determined with certainty that it was not a Western military missile, certainly not the IDF's, "Following the article I published on the subject, many people pressured the BBC to reexamine the details. The reporter turned to the boy's father again, but did not really research the subject. They spoke of missile types and decided that it was still an IDF missile, but a UN report published several months later stated explicitly that there were several Palestinian children killed by Hamas rockets, ...From the details I understood that one of them is this boy." To date, Elder has uploaded about 30,000 posts, which rank high on Google searches. His dream is to set up a website parallel to The Electronic Intifada, the BDS homepage, which gathers all the information and articles published by other organizations related to the boycott movement. "I would like to collect all the articles from the Blue Network [the network of activists at the conference,] where everything will appear in one place, and I also want to see to it that there is a variety of opinions and approaches." The latest "massacre" in Gaza is done by - UNRWA? Should We Carpet Bomb Gaza?